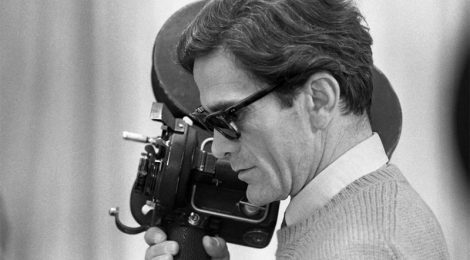 Pier Paolo Pasolini (1922-1975) is one of my favourite intellectuals of the XXth century, for many reasons. Firstly, he was talented in a number of artistic forms (poetry, prose, essays, film directing, painting); secondly, he constantly questioned the establishment and decried hypocrisy among the rich and powerful, including the church and politicians; thirdly, he was half Friulian – his mother was born in Casarsa (Pordenone) not far from my birthplace. After being assassinated on a beach near Rome in 1975, he was buried in the Casarsa cemetery next to his mother, who died after him. Pasolini wrote some early poetry in Friulian as he loved the earthiness and simplicity of people from the countryside of this region. The poem I present below is in Italian and was composed while living in Rome. He often wrote about young men living squalid lives without a purpose. I like this poem’s imagery. Un lungomare. Lumi bianchi, schiacciati. Vecchi lastrici, grigi d’umidità tropicale. Un silenzio come nelle città del Nord. – come algerini condannati a morte. di legno; una coperta, stesa sulla sabbia nera. cocenti di frasi musicali d’oriente). Here is the translation by Lawrence R. Smith, found in his anthology The New Italian Poetry – 1945 to the Present. The spelling is American, and the translation includes a line or two I find dubious. A sea promenade. White lights, crushed. / Old paving stones, gray from tropical dampness. / Steps, down to the black / sand; with papers, trash. /A silence like that of the Northern cities. / Here are boys with blue jeans the color of carrion, / and white, clinging, filthy / sweaters, who walk along the parapets / – like Algerians condemned to death. / Someone farther away in the hot shadow / against other parapets. And the sound of the sea, / which stops you from thinking… Behind the open space / of chipped sidewalk (toward the pier), / some younger boys; piles [I would say ‘poles’], wooden / boxes; a blanket, also on the black sand. / They’re stretched out there; then two get up; / they get to the sidewalk on the opposite side, / along the lights of the bars, with porches of rotten wood / (memory of Calcutta… of Nairobi…) / (Dancing music, far away, / in a hotel bar, from which only / a deep humming arrives, and bitter / lamentations of oriental musical phrases). / They go into an open air shop… / the poorer they are the more full of light, / without metal, without a window… They go out again, / go down again. They eat, in silence, / in front of the sea you can’t see, / what they’ve bought. That guy [I would say ‘the boy’]/ stretched out on the blanket doesn’t move; he smokes, / with a hand on his lap. No one / watches to see who’s watching them (like gypsies, / lost in their dream). ← Ne vale la pena!